Think Alps and we Indians get images of Switzerland in our head – snowcapped peaks, lush green meadows, cow bells, Shahrukh & Kajol etc etc. However, the Alps range stretches halfway across Europe – from France, across north of Italy, Switzerland (of course), the tiny country of Liechtenstein, Germany & Austria. And while all of the Alpine regions are very pretty, the Alpine lakes are in a league of their own. 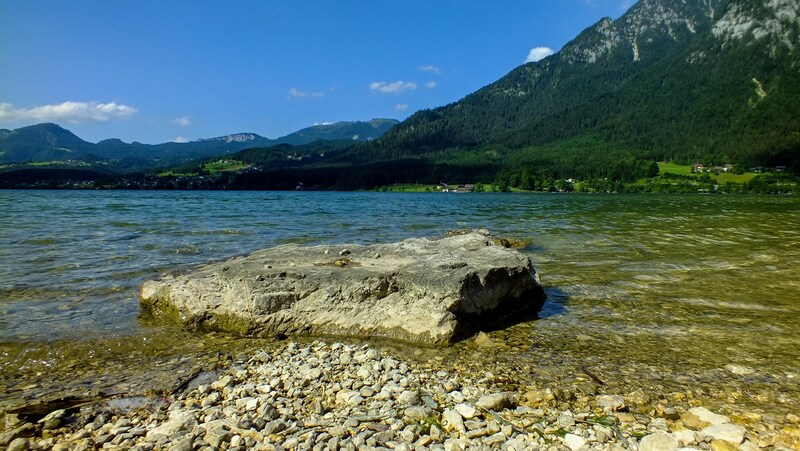 Whether it is Lake Geneva in Switzerland or Lake Cuomo in Italy, Alpine lakes are usually breathtakingly beautiful. 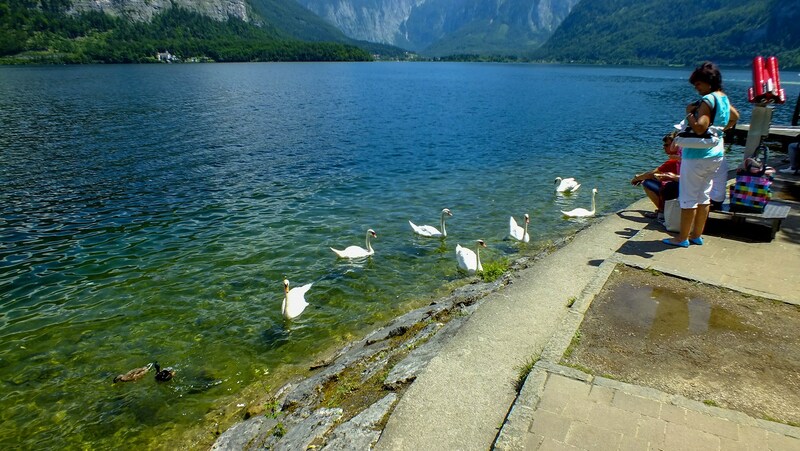 Our destination was Lake Hallstatt, a slightly lesser known, but no less beautiful Alpine Lake in the Salzkammergut region of Austria (also known as Austrian Alps region). The tiny town of Hallstatt lies on the shore of Lake Hallstatt (called Hallstätter See in the local language). 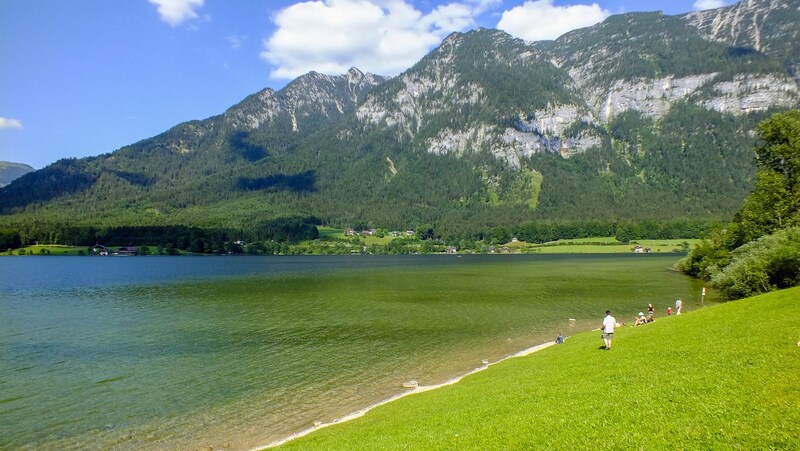 Earlier, the town could only be reached by boat from the town of Obertraun on the opposite shore, but now has a beautiful road connecting it to Bad Ischl, onto Salzburg. 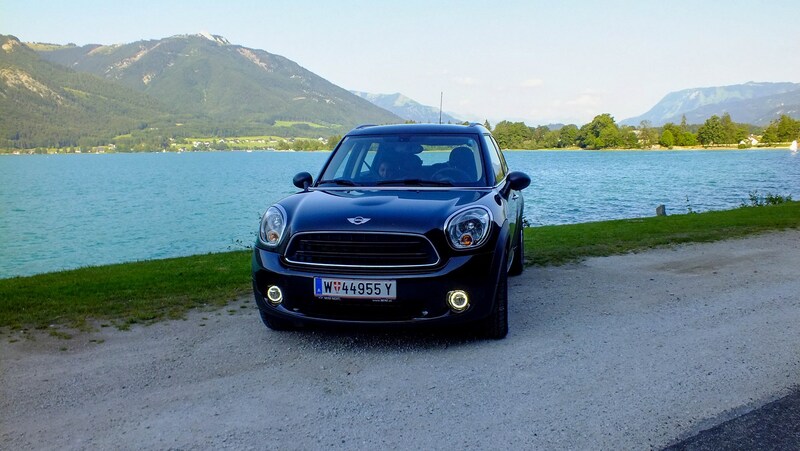 So on a beautiful July morning, we set off from Salzburg on a 80km drive to Halstatt, in our Mini Countryman. The Mini is a beautiful driver’s car and roads/traffic in Europe are a peach compared to the subcontinent. I didn’t even have to flash my lights for overtaking – people would free the lane the moment they saw me approaching. Add beautiful weather, the scenic Austrian countryside and the Mini’s plush audio system – and things were just right in the world. *The left hand drive isn’t a problem at all in the highways, but requires a lot of attention inside cities. The B158 road to Hallstatt passes the smaller Wolfgangsee lake before Bad Ischl. The lake and small lakeside towns of St Gilgen and Strobl are very picturesque and we were really tempted to make a detour and stop for a while. But we missed a couple of turnoffs and rather than take a U-turn, we decided to keep moving forward. And as it so happened, after seeing Hallstatt, the 10.5 km long Wolfgangsee seemed puny in comparison. Once the B158 touches Lake Hallstatt at its northern end, the lake rushes past on the left, peeking between trees and rocks as the road climbs up and down. At a lot of places along the road, there are parking places made next to the lake, enabling people to head down to the lake easily. Although again tempted to stop at one and enjoy the lake, we really wanted to reach our destination first. The town of Hallstatt is so tiny that it can be crossed in 10 min of walking – and there are just 946 inhabitants according to 2001 census. Think of it this way – there are more people in a single housing society in Mumbai than in this town ! The low population is probably because the narrow strip between the lake and the surrounding hills can sustain only so many people. Nevertheless the town is accessible by foot only – there are three large cavernous parking lots on the outskirts of the town, where all cars are to be kept (the only analogy in India is the vehicle parking in Matheran). With such a small number of dwellings, accomodation is understandably tough to find. Good hotels and B&Bs are booked month in advance. So we had planned to spend only the day in Hallstatt and head back to Salzburg in the evening. After parking the car, we got ourselves tickets to the boat ride on the lake, which leaves every hour. Since we had almost an hour to kill, we headed to the next touristy thing to do – the salt mines. 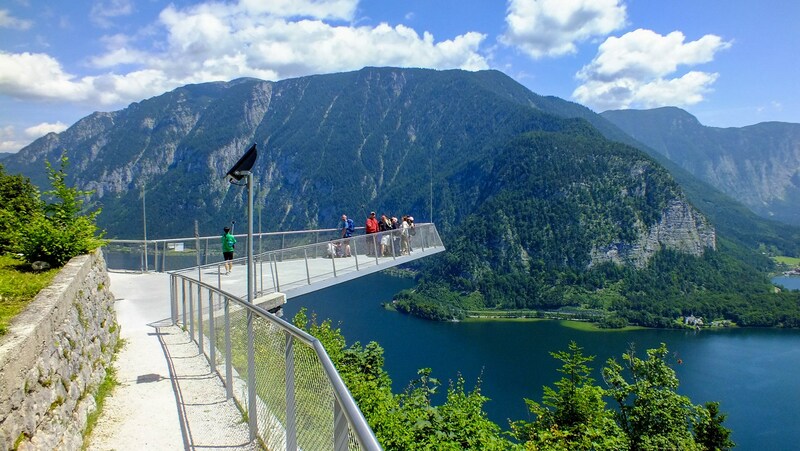 In prehistoric times, salt was a precious commodity (supply chain from the sea hadn’t quite been worked out) and the cliffs above Hallstatt are rich in salt. Salt has been mined from these hills from as far back as 2,000 BC. We didn’t want to tramp around some old mines, but a sky deck near the mine provides jawdropping view of the region. So we hopped onto one of the steepest funicular trams we have ever seen and headed to the skydeck. And the views were really worth the expensive ride up. Almost the whole lake of Hallstatt is visible. The tram itself is quite a ride, as can be seen from the pic below. The boat ride around the lake lasts an hour. 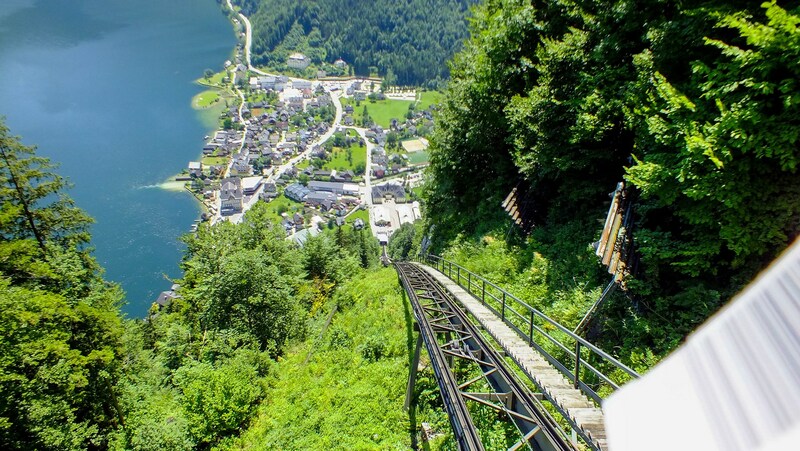 It heads to the town of Obertraun, which is also the nearest railway station. 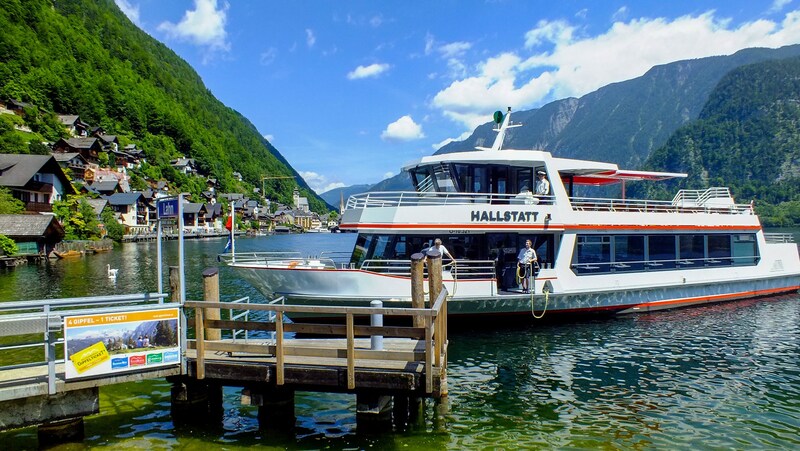 From there the boat takes a long circuitous route back to Hallstatt, giving beautiful views of the town. You can have local beer while on the boat, or just soak in the views. Once back in the town, we explored it more on foot, looking for a place to eat. We chose a beautiful restaurant overlooking the lake for lunch. But for some inexplicable reason, the food just failed to arrive, even after numerous reminders. After a while the waiters weren’t seen either. So after waiting for 45 min we gave up and left. We had to settle for hotdogs and burgers from a streetside takeaway place as lunch. Thankfully yummy gelato was there for dessert. We missed the last cable car to the Dachstein Ice Caves (lack of research on our part). But that left us with enough time to park our car in one of the roadside clearings and go stretch ourselves on the lakeside. It was like a picnic location with many locals sunbathing themselves on the green grass near the lake. There was a small convenience store selling coffee and brownies. 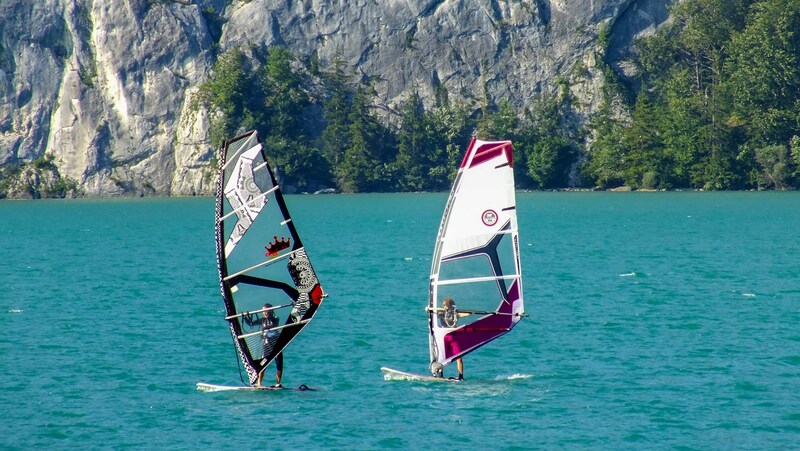 We sat on the grass looking at windsurfers practice on the lakes – there was a nice gentle wind that day. We even met an Indian honeymooning couple there! 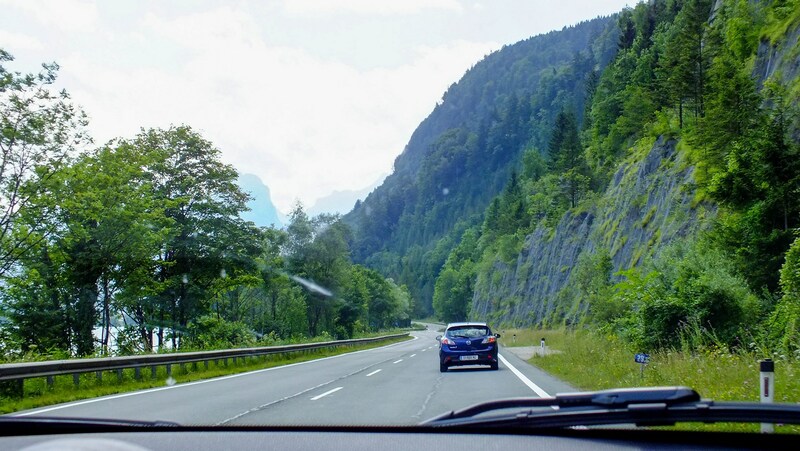 The rest of the drive back to Salzburg was uneventful – we didn’t stop at Wolfgangsee – and we were back in Salzburg within an hour.